This at-home test is an easy way to evaluate the level of vitamin B9 in your body, identify deficiencies and help you determine if dietary changes may be needed to help address conditions like fatigue, blood disorders, or potential pregnancy complications. Vitamin B9, or folate, is commonly found in green vegetables, fruits, and nuts. It’s crucial for creating your DNA (pretty important)! 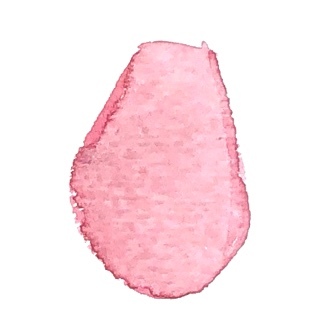 Like B6, it is also necessary for the normal formation of red blood cells which carry your oxygen. If you don’t get enough B9, it can cause things like mouth sores and fatigue. Plus, it’s especially important if you plan to become pregnant, here’s why. 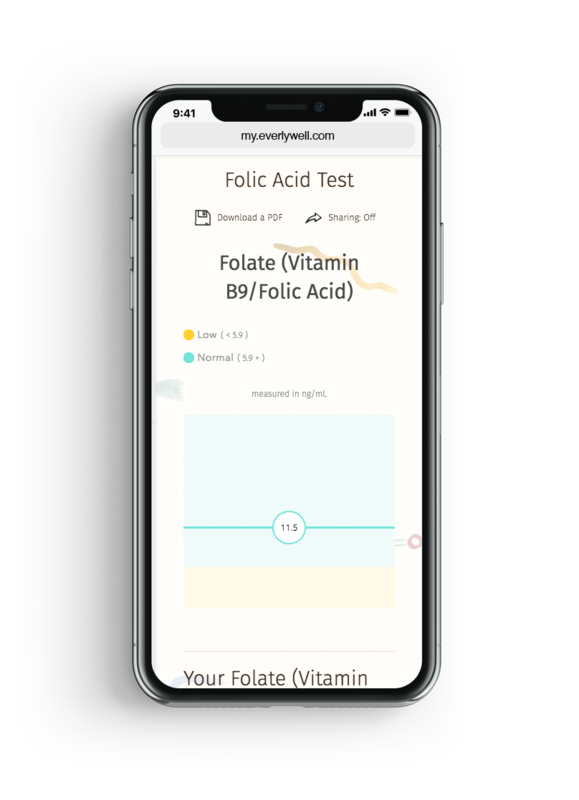 The form of vitamin B9 found naturally in foods is folate, but you may be more familiar with hearing it called folic acid. Folic Acid is the synthetic form of B9 found in vitamins and supplements and used to fortify foods that don’t naturally have B9. Vitamin B9 is crucial for cellular health because it is needed to make DNA. This at-home test will let you know your B9 levels and if they are where they need to be for optimal health. 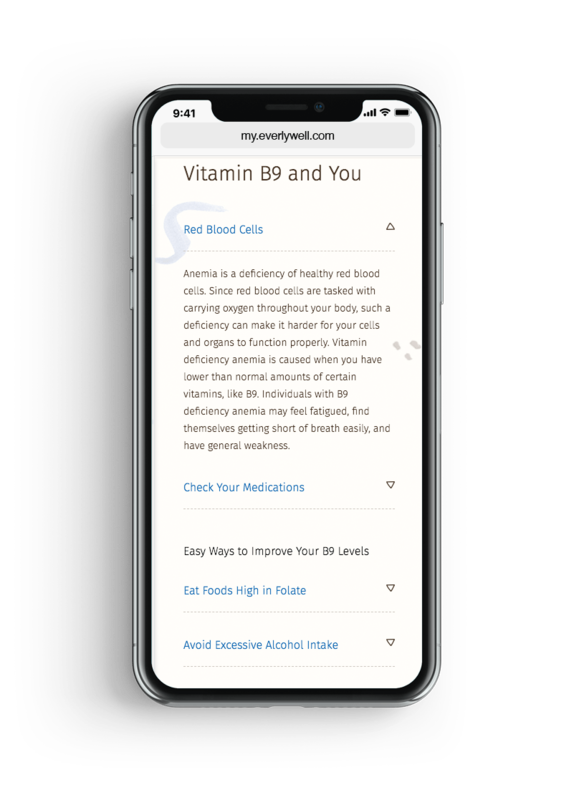 There are several possible reasons why you may want to learn more about your vitamin B9 levels. 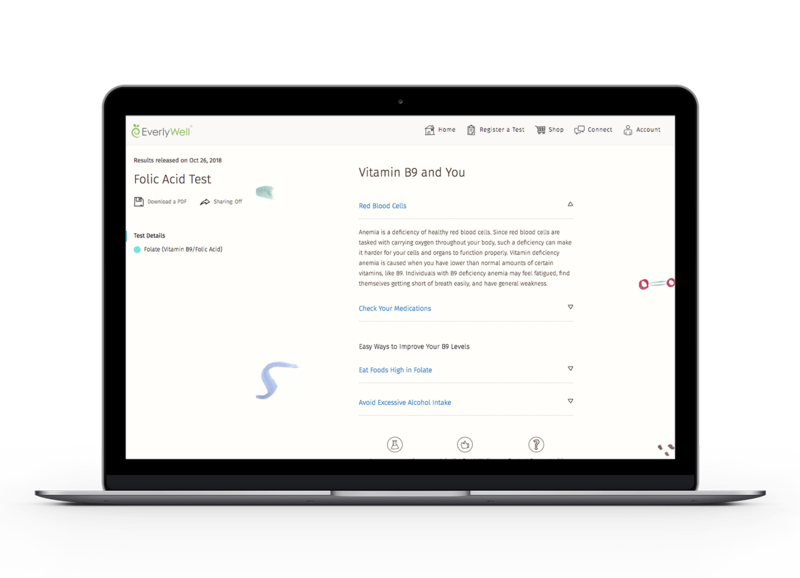 Assessing your vitamin B9 levels can give you answers to important questions about your body's wellness. 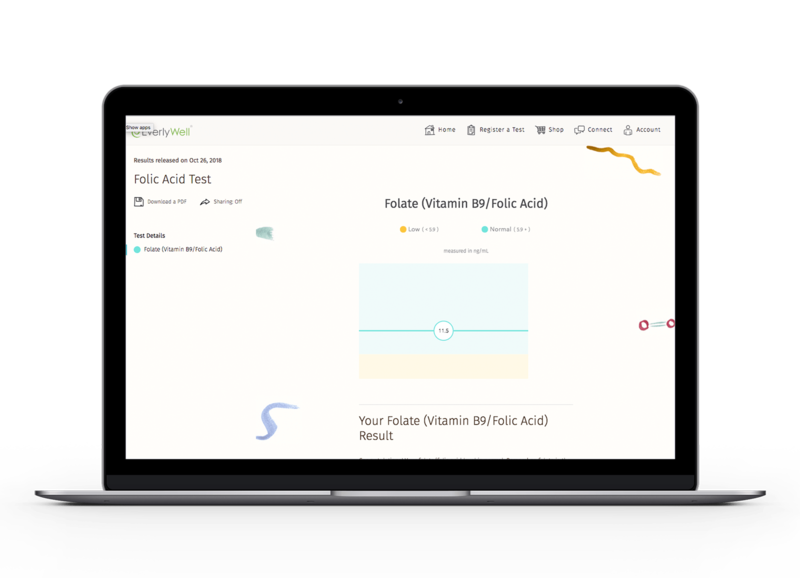 Your results will show you if your vitamin B9 (folate/folic acid) level is within a normal range. Vitamin B9 is important for making DNA, repairing DNA, normal red blood cell development, and fetal development -- so having healthy levels of this vitamin is crucial throughout life. What guidance will I get with my results? 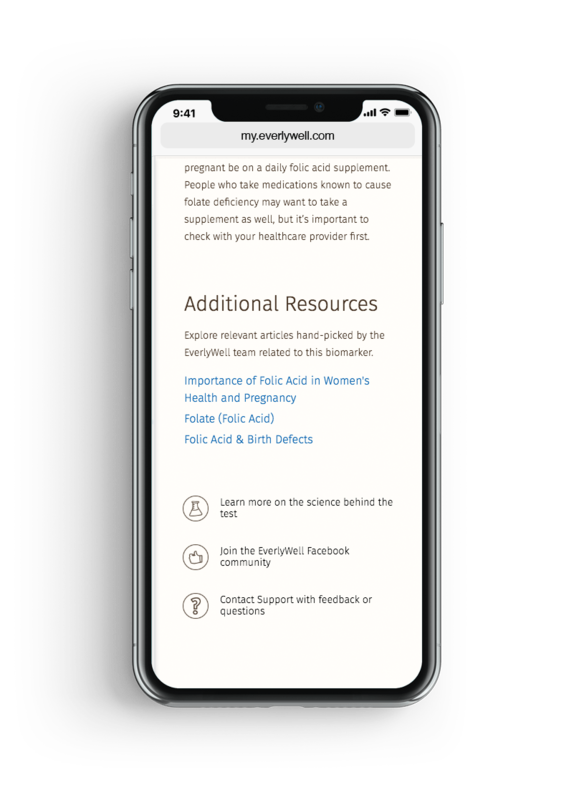 You will get your vitamin B9 (folate/folic acid) level and guidance on how to improve or maintain healthy levels of this vital vitamin for your overall wellness. 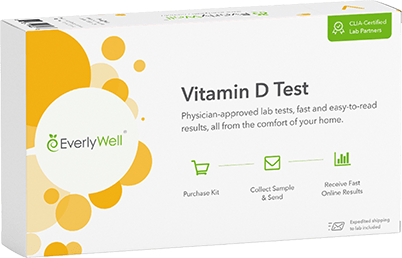 What if Vitamin D levels are abnormal? What can cause someone to be lacking in these important B vitamins? How much sun exposure is needed for adequate Vitamin D production? What are the symptoms of B9 deficiency? What are the symptoms of B6 deficiency? What foods naturally have Vitamin D? What is tested for on our B Vitamins Panel? What are the most common sources of B12? How common is it for a Vegan or Vegetarian to be B12 deficient? 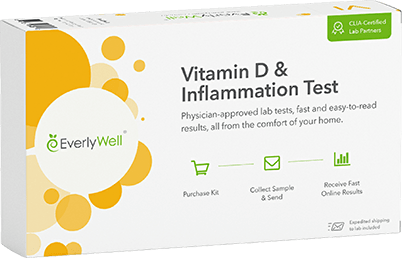 How does being deficient in the B vitamins test on our panel affect overall health? What if my B vitamins result appears higher than expected? What are the most common sources of B6? What are the most common sources of B9? How long do the samples last after collection?